The Northeast corner of Minnesota is known as the Arrowhead. That's primarily because it forms a shape something similar to an arrowhead, with the border to Canada to the North, and Lake Superior to the South. There is also a divide that cuts through the area, where water to the North flows into Hudson Bay, and into Lake Superior (and eventually the Atlantic Ocean) to the South. Back in the 1800's, when the fur trade was active, trappers and traders used to use these border lakes to travel on. If you look at a detailed map, you can use the (primarily) East-West biased lakes and rivers as a highway from Lake Superior into the forest wilderness. There are still beaver, moose, bear, loons and other wildlife that enjoy the relatively deserted area. Fast forward to World War II, and this iron-rich area was mined to build warships. Even today, there are still taconite mines (a relatively low grade iron ore) that are active because of the easy access to Lake Superior and commercial transportation. Most of the Arrowhead today is part of the Superior National Forest, and a good portion of the Superior National Forest makes up the Boundary Waters Canoe Area Wilderness (also known as the BWCA or BWCAW.) A designated "Wilderness" area has a few rules, like no motors of any kind are allowed. No cars, no boats with motors, and I believe you can only fly over it in emergencies. There are limited designated camping areas in the BWCA, so entry permits are required for anything over a day trip. 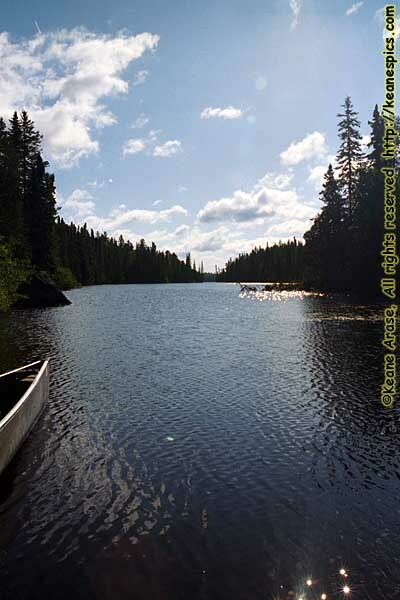 Along with the BWCAW's sister park, Quetico Provincial Park in Canada, this area is a canoeist's and camper's dream. It's just a little bit out of the way. I first started going up to the Arrowhead in June 1988. The mosquitoes were so thick, they tried to pick up my car to keep me from getting away. But I was back in September 1989, after all the blood sucking insects had gone dormant for the year. And in an 11 year span from 1988 to 1998, I was there 9 times: June 1988, September 1989, September 1990, September 1991, September 1992, August 1994, September 1995, September 1996 and August 1998. It's 520 miles from my house, but you have to tack on another 85, since you have to drive around this obstacle called "Lake Superior". If they'd just build that bridge, or drain the lake, it could take an hour-and-a-half off my trip. Someone get on that for me. Thank you. It is, in a way, a more primitive and even quaint place, much of that fostered by the tourist industry that wants to attract the crowd that wants to go to out-of-the-way places. If I take an honest look back, it's probably no different many other places I've been to, it was just more unique to me back then. US-61 used to be (and as far as I know, still is) a two lane crappy road, the most direct motor link between Duluth and Thunder Bay, Ontario. Minnesota was gradually making improvements to the road, so it might be much better than it was when I was last through there. The last Ice Age pretty much scrubbed the entire area clean, and due to the geology, the rock here is some of the oldest on Earth. Topsoil is thin, and in place where trees have been knocked over by storms and wind, you can see the bedrock just inches below the surface. In other areas, the hard rock is plainly visible. Anyway, since Lake Superior is the final drainage for the area, there are a lot of rivers from the North that flow into it, and there are a number of waterfalls that you can stop at and investigate. The brownish stain of the water are from tannin swamps further north. Gooseberry Falls is the first major set of falls along US-61. Only a single picture from Split Rock. sigh. At one time, US-61 followed the outside of sheer cliffs, with jersey walls on the Northbound side with a sheer drop off into Lake Superior just on the other side, and jersey walls on the Southbound side with a chain link fence just on the other side to try to keep falling rocks from falling onto US-61. So in the most dangerous areas, they finally decided to drill through the mountain rather than go around it. Grand Marais is the largest town between Duluth and the Canadian border. 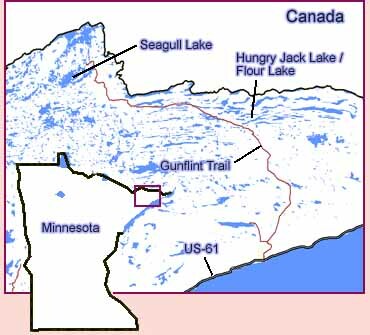 It exists mostly because the Gunflint Trail intersects with US-61 here, and it's one of the primary entrance points into the Boundary Waters Canoe Area Wilderness. There is a ranger station here that will issue entry permits. It's also the last populated place before turning up the Gunflint, so we've always stopped here for fishing gear (licenses and leeches, that sort of thing), gas (there is none up the Gunflint) and groceries that weren't brought from home. There are corridors through the wilderness area, roads for the tourists and an active logging industry. One of these corridors is The Gunflint Trail. The Gunflint Trail is a two-lane road that travels 60 miles into the Superior National Forest, mostly North until it gets close to the border of Canada, then turns mostly West following the border until it ends at a National Forest Campground. The appropriately named the End of Trail Campground lies on the Seagull River, with some very nice scenic views. It's the only way in and out of the area. A bad storm came through one year we were there, and knocked out the power and closed the Gunflint for a day until they could clear the trees that blocked the road and took out the power lines. Were we affected? Yes. Did we care? No. We played cards by lantern light that night, and went fishing the next day. End Minnesota Arrowhead - Part 1 of 6.